An ancient structure with wonderful architectural features, the Church of San Fructuoso is a beautiful chapel in Spain. It is a warm place that emanates an aura of peace. Though not a very popular destination among tourists, this place is ideal for those looking to spend some quite time. The walking paths and the grounds are well-maintained and clean. The relaxing atmosphere of the cathedral is a welcome change for all those who are looking to spend some time away from the hustle-bustle of the city. Create a customized plan for your visit using the Santiago De Compostela trip planner. You can use ready templates or start from scratch for the same. Oomph up your visit by adding the best hotels in Santiago De Compostela like Pr Fornos, Hotel Lux Santiago and Capitol Boutique Hotel. Find out how to reach Santiago De Compostela to begin with. Plenty of wholesome Santiago De Compostela vacation packages are available to choose from, pick your today! Love this? Explore the entire list of places to visit in Santiago De Compostela before you plan your trip. Fancy a good night's sleep after a tiring day? 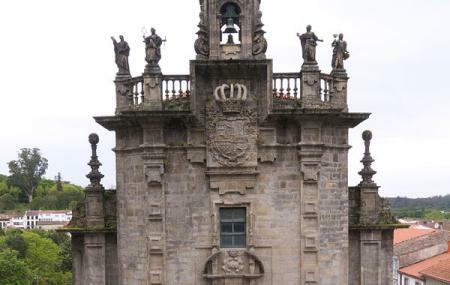 Check out where to stay in Santiago De Compostela and book an accommodation of your choice. Krásný, často navštěvovaný a fotografovaný kostel. Nachází se poblíž známé katedrály. Naproti němu se nachází ředitelství místní policie. Bonita iglesia próxima al Obradoiro. Solo abierta a las horas de culto y poco más. La música gregoriana invita a tu reflexión personal. Cada día en un atril nos recuerda la intención de ese día. El día de mi visita 14 de Agosto en Memoria de S.Maximiliano M. Kolbe, sacerdote católico que ofreció su vida en el campo de concentración de Auschwitz, para salvar a un padre de familia.